It is winter in our valleys. It is a peaceful time of year. Not many visitors. But the fish still have to feed. So the fishing can be excellent in the right circumstances. The behavior of winter fish is driven by several factors. The water temperature, the water flow, the presence of ice and the availability of food. This means that the fish will attempt to conserve energy and replenish it where possible with the greatest efficiency. This translates to the fish lying in the slower deeper water or behind large rocks, boulders and obstructions where they will not expend too much energy fighting the current but will still be able to feed. They will be lethargic to conserve energy and they will prefer to wait for the food to drift to them feeding as the opportunity arises. Generally this results in the fish tending to pod up and lie in the deeper waters. The water at the bottom of a deep hole moves more slowly than at the surface. Furthermore, food washed down the water course will tend to drift to the bottom in the slower water. In addition, the midge larva emerging from the sediment will be more accessible if the fish stay close to the bottom. Consequently, the first thing to remember is that one has to get the fly down to the fish. Therefore weight is essential. In addition, especially in the case of midges, the fish will not move far laterally to feed. This calls for sight fishing and accurate casting. If your fly is not catching on the bottom from time to time, you are not fishing with enough weight. In addition to fishing deep, on a sunny day when it warms a little, there will be midge hatches from time to time, so the dry fly fishing will also be productive in the correct circumstances. However for this fishing, it will be important to find an area where the sun has been on the water for some time. The problem in the deep Frying Pan Valley is that at the height of winter, the low sun doesn't get much of a chance to warm the water. Up towards the dam where the valley widens out, the sun will reach the water even on the shortest days. 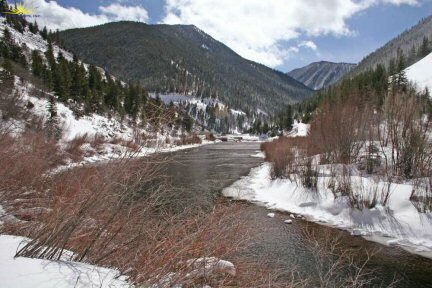 The Roaring Fork offers greater opportunities because the Valley is wider and the sun has a greater chance to warm the water. If the Pan is running strongly the best fishing is just below the confluence with the Fork because the slightly warmer released water from Reudi will slightly elevate the temperature of the Fork at this point. The other problem of winter fishing in the colder weather is the formation of anchor ice and ice channels. Essentially this is a problem of low water flow. Anchor ice makes fishing virtually impossible. Ice channels narrow the water flow confining the fish to the faster running water which increases their stress as they are forced to expend more energy in the current. We have discussed this in a separate article to which you might usefully refer. But, all that being said, one can't overstate how good the winter fishing can be on the Pan near the dam when the conditions suit. In the last 2 years, with the introduction of hofers into the Pan, the dry fly fishing on some winter days has been fantastic. The fishing is better if there is no wind and it is not too cold. If the temperatures are approaching 15 degrees and lower, things tend to slow down. But an ideal day would be calm overcast weather with the temperatures from 20 degrees and higher. In addition, fish in the sun or the light. When the low sun falls below the peaks along the Pan it gets colder and the bug hatches slow. Over the past several years, it has been evident that the interest in winter fishing is increasing. It is not often that one can go up to the flats and see no cars at all. And on some sunny days, it is quite extraordinary how many fishermen will get out onto the river to enjoy the quality fishing. Clothing for Winter Fly fishing. Wear clothes in layers as the temperature can get warmer as the day progresses. Long underwear, gloves, hat, and a warm parka will be sufficient. We carry Helly Hansen under-garments which are excellent for fishermen. They are designed for more active outdoor activities but work perfectly for fishermen standing in the cold water. For gloves, the mittens which can be folded back to permit the fingers to tie flies on are the best. It doesn't take long for the fingers to get cold quickly. The hardest thing I find to keep warm are the feet. Wool socks work for a time, but there is no ready solution to the cold feet syndrome. I wear a lighter and a heavier pair of socks. The 2 layers actually create a barrier which tends to hold a little warmth. It is also possible to put chemical warmers in your boots. It is a product skiers use. A small sachet which warms when exposed to the air. They are cheap and will last for 6 - 8 hours. We carry them in the shop. They are made as hand or footwarmers, but the principle is the same. Subdued clothing colors are important. Polarized sunglasses are a must. The bright sun reflecting off the snow can be almost blinding. Most of the fly-fishing shops have rental equipment or provide equipment on their guided fishing trips. A #4 or #5 weight fly rod with a floating line. Even though you will fish deep, the Frying Pan is not a particularly deep water so a leader with weight will still easily get you to the bottom. If you have a choice a longer rod is preferable as it will assist in high-sticking while nymphing. Waders and felt soled boots, gloves, polarized glasses, flies, weight, strike indicators, hemostats (to pinch down the barbs and to release the fish with out hurting them) and a net. Always include a flask with something hot to warm from the inside out. If you prefer the dry fly, consider a soft tipped rod. I discuss my rods below. Essentially if fishing the flats, I prefer a #3 Hardy fiberglass "Stream" above all else because of its delicacy and subtlety. One other useful item of equipment for when the temperatures are particularly cold is a non-stick product which will cause the water to immediately run off the guides when they get wet. If the water remains it will ice up quickly so you will have to clean the guides every few casts. It gets frustrating. I use a non-stick spray used for cooking, but there are similar products in the fly shop if you forget. Winter fishing offer the opportunity for both dry fly and nymphing. The Pan is one of the few waters around where some excellent dry fly fishing can be had on New Years day. The key to any good fishing is to understands the behavior of your quarry. In simple terms, in winter unless there is a midge hatch taking place, you will fish deep in deep holes with weight to get the fly down to the bottom. Principally the fly of choice will be midges. We have discussed midges separately so you may usefully refer to those notes at your convenience. Essentially you will be weighting the larva to get it near the bottom, and ideally you should sight fish and cast accurately to get the fly directly in front of the fish. Winter nymph can also be very productive. Nymphs will tend to be knocked off surfaces with moving ice becoming vulnerable. In this instance, as the nymph will be a "crawler" rather than a "swimmer" it will drift helplessly until it can regain a grip. Consequently, the ideal technique will be to dead drift the fly with as little drag as possible. Achieving a dead drift will also be assisted by holding the rod as high as comfortably possible to minimize the line on the water ("high-sticking"). A longer rod will also help in these circumstances if you have a choice. By casting up stream and letting the fly drift back, one will achieve a longer dead drift than fishing across stream. Use strike indicators to detect the subtle take of the feeding fish. Because the fish are lethargic, there will not be a plethora of sudden sharp takes. Rather they will be slower and more subtle. Egg patterns are always worthwhile in winter. Although the spawning occurs at the end of autumn and early winter, some fish will spawn a little later. In any case the fish will remember the spawn for a month or so. Later in winter when the brown fry start to emerge, fishing a streamer down deep will produce the bigger brown trout. Closer to the dam on the Frying Pan where the midge hatches will occur in the 40degree water, the dry fly activity can be excellent. Generally it is a matter of very small midge patterns on very light tippet. On extreme days, I have used 10x and #32 flies but generally 8x and #26 - #28 flies will work fine. One point to note, if you are using light tippet, try and use a soft tipped rod. A medium to a fast graphite rod will not have enough flexibility to withstand a sudden rush from a hooked fish and you will break off a lot of flies. Personally I use either a Hardy fiberglass "Stream" or "Test". The fiberglass rods are amazingly soft and enable the pressure from a sudden take to be absorbed better than graphite. But even so, on light tippet even the shake of a large hofer's head can snap the line if it is taught. The disadvantage of a glass rod is that it is harder to control a large fish and takes longer to land it. This will not be good for the fish. However, near the dam on the Frying Pan the water is usually 40degrees because of the bottom release and the fact that the dam has turned over for winter. So the fish seem to recover quite well. That is the attraction of such a tailwater! 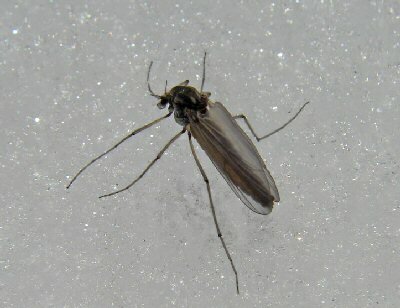 The midges can be remarkably small and varied in color. If you get a chance, look at the size of the naturals on the snow banks. Some midges are in the #22 range while others are smaller than #32. In addition the colors range from black through different shades of gray. So take your time and be prepared to experiment if you are fishing dries. One day a black pattern will work and a day later they will concentrate on a tiny Parachute Adams. The next day, they will reject the Adams and take a special emerger. There is little rhyme nor reason but it is fun finding out. In winter handling the fish carefully is important to assist in sustaining the fish population. First and foremost, as winter feed is sparse and the fish are in a more hostile environment than summer, the more energy they expend the more quickly they lose condition. Therefore ideally one should seek to land and release the fish as quickly as possible to avoid unnecessary exhaustion. The other important thing to note is that on particularly cold days holding a fish out of the water for a photograph for longer than 20 seconds can result in freezing of the gills and consequently a permanently injured fish. Therefore it is preferable if the fish can be released without taking it out of the water. There are commercial quick release devices available which facilitate this goal expeditiously. We advocate their use. One final comment. I personally don't advocate pumping fish to find what they are eating. If you caught one, something worked. If you didn't catch one, the issue is moot. However, if you must pump a fishes stomach, don't do it in winter. It stresses the fish too much and it has to replace the food you just expelled from it. 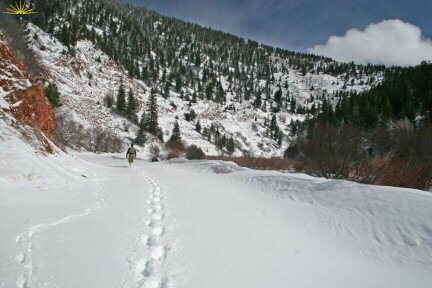 If you still want to do it in winter then try it to yourself first on the river bank and see how it feels. Parachute Adams #22 - #32.
for further ideas on flies refer to the archives of the weekly reports. Each week our guides make suggestions for flies which were working that week which might be of some benefit.